You’d have to be barking mad to pass up the chance to play this canine-themed 5 reel. Doting Dogies features all your favourites; Alsatians, Beagles, and even Pugs. Think Crufts, but an online gaming slot at Wizard. Eyecon was initially founded in Brisbane, Australia and have since become a well-established online gaming developer, creating all sorts of casino slots online and boast a range of titles that include 99 Time, Temple of Ausar and a whole load more. Established back in 1997, Eyecon has an impressive portfolio for your selection with a choice of over 100 online slot games. 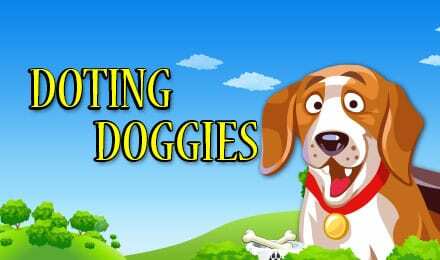 If you’re an animal lover Doting Doggies is the game for you. This adorable game features five reels and fifteen pay lines and several different breeds of doggy characters across its reels. It's a howling good time with loads of chances to win big! 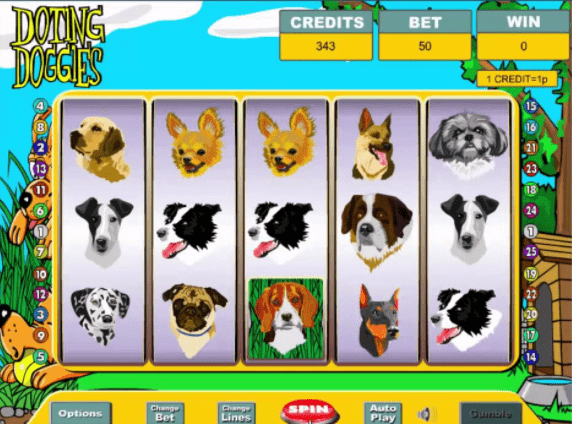 You'll enjoy reels full of the cutest pooches, multipliers, free spins and many more. Most animal lovers try and play popular online slots like this one. The game has the cutest visual appeal with a background overlooking a backyard with dogs playing with a ball, a kennel and trees. Symbols you will find on the game’s reels are a Bone, a Labrador, Griffon, Pug, German Shepherd, St Bernard, Pointer, Doberman, Maltese, Dalmatian and Chihuahua. There are 5 reels, 15 pay lines, loads of different pooches across the reels, bonuses and more! The Beagle pup is your Scatter, and spinning 3 or more will trigger your free spins! Plus, during this bonus, all of your wins will be tripled! There's also a Dog Bone Wild, which can take place of any other symbol except the Scatter, and your prizes will be doubled when it completes a winning line. The stakes available on the slot are £0.01, £0.02, £0.03, £0.04, £0.05, £0.06, £0.08, £0.10, £0.15, £0.20, £0.25, £0.30, £0.35, £0.40, £0.50, £1 or £2. The game also enables you to select the number of lines from 1 to 25, through the Line Up and Line Down. Auto Games is at ready at hand for your own convenience, where you can select 10, 15, 20 or 25 games to spin. The Bone symbol represents Wild that substitutes for all symbols with an exception for the Beagle symbol. Whenever the wild comes in a winning line, the prizes are doubled. You can get big payouts for lining up either 5, 4, 3 or 2 symbols in a line. Scatter is displayed by the cutest looking symbol in the form of a Beagle pooch. Scatter wins of 2, 5, 20 and 450 times total wager is awarded for 2, 3, 4 or 5 symbols appearing anywhere on the reels. Land on 3 or more of the Beagle symbols will also trigger the awesome Free Spins round, where 15 Free Games are awarded. This Free Spins feature can be retriggered to a maximum of 15 times woof! If that wasn’t enough to get your slobbery chops round, the Gamble Bonus round is available on Doting Doggies Slot. Enabling you to increase your winnings, you either pick red to gamble your win or black to double it easy as that! Your gameplay in this round will continue until 5 correct selections have been made, the next win goes above its maximum payout or if an incorrect selection is made. Give the dog a bone and get that tail wagging! It's one of the cutest and entertaining animal slot games, so come to see what all the fuss is about and play today. Doting Dogies mixes minimalist design and simplistic graphics with highly detailed symbols and responsive gameplay to create a slot game that really instils the fact that these colourful pooches are mans best friend. Another popular game you can try is fluffy favourite slots.